I adored the gown Arwen wore in Elrond's vision of her future, where she mourns Aragorn's eventual death. 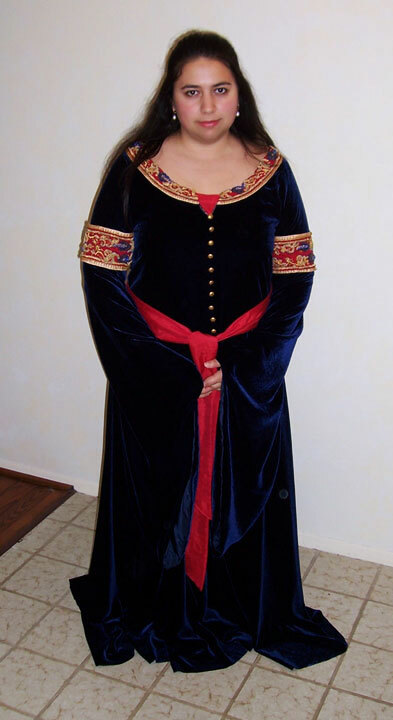 I made this gown from a midnight blue rayon velvet, with red thai silk for the sash and neck inset. The sleeves were lined with navy china silk. The buttons were bought from the company that supplied them for the movie, so they are exactly the ones used on the real dress. I had to age them myself. I made the trim from scratch, embroidered red fabric with chenille wool, seed beads, gold thread, and bullion appliques cut to make the right shapes. The edges are all loops of bullion, individually sewn down. The veil is navy silk chiffon, and the crown is made from gold foil, which I embossed with the tree of Gondor. I redid this gown in silk velvet, because rayon velvet creases way too easily and is so easily wrecked. Silk velvet is less stiff and more drapey and doesn't seem to crease as badly. I reused everything else from the original gown. Here are two arty shots I just love of this costume - it's version 1.0 though. Here's version 2.0 in silk velvet.